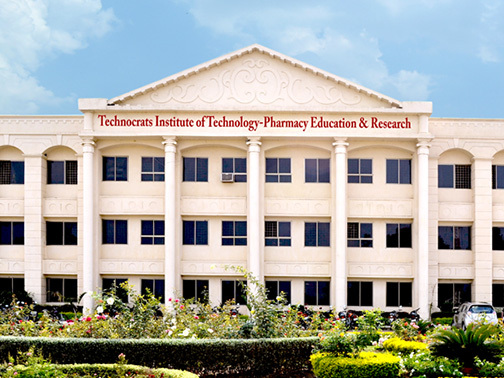 Technocrats Institute of Technology-Pharmacy Education & Research is one of the premier institutes in Pharmacy Education, Research and Pharmacy Practice at national level. It provides students an understanding of values and ethics, to create technologically superior and ethically strong global manpower, in the arena of Pharmacy profession. The Institute develops highly skilled students with the ability to adapt to an intellectually and technologically changing environment, with the participative efforts of the management, staff, students and parents. The Institute promotes research in the field of Pharmaceutical sciences, Clinical Pharmacy & Drug Development with the aim of extending Pharmaceutical care to the society. The Institute is dedicated towards the tasks of improving the quality of Pharmacy Education by imbibing students with the spirit of excellence and providing guidance that is compassionate and wise. It gives me immense pleasure in welcoming you all to Technocrats Institute of Technology Pharmacy Education and Research.Pharmacy Profession is one of the most dynamic fields in the healthcare system that has undergone several paradigm shifts in last two decade. Pharmacy education also witnessed several developments from ancient time to till date. We are living in a globalization and choice based system, where numbers of options are available in term of medicine, product, services, type of treatment therapy etc. In this competitive environment, pharmacists need to have complete ancient time to current knowledge. India is leading quality medicine manufacturer worldwide and has maximum number of US FDA approved medicine manufacturing plant out of USA. Indian Pharmaceutical Industry isgrowing consistently. India due to lower cost of production of medicine and other pharmaceutical products has become the choice for various multinational companies. The Pharmacy students need to developtheir theoretical as well as practical knowledge, excellent professionalism, moralityand desire to complete given task and honesty in order to meet the global challenge which the various pharmaceutical industries expect from students. Technocrats Institute of Technology Pharmacy Education and Research provide a platform which will develop your hidden talents besides giving a favorable environment to develop personality and skill. Our prime concern is to empower young pharmacist to combat the challenges they encounter in the 21st century. Once again I warmly welcome our entrants and wish a very successful career & best of luck for future endeavours.